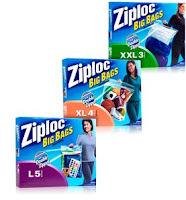 Ziploc has a coupon available for buy one get one on their Big Bags. These bags are available in three sizes: L, XL and XXL. You can get your coupon here. We have used these bags for many things. One time, we used one to bring along a change of clothes for everyone to the amusement park - and a good thing that turned out to be, when my daughter got sick on the way home. The bag was lying on the floor and protected not only the contents, but most of the floor beneath her car seat. That was definitely some sort of luck that we put that bag where we did. They really can be a great tool in helping you organize. We've used them to store those soft and/or oversized infant toys that just don't seem to fit right in a box. They report that the XXL bags will hold golf clubs - I've not tried, but it certainly gives you a size perspective. The double seal helps keep the contents clean and dry. The bags also have built in handles to make carrying easier.